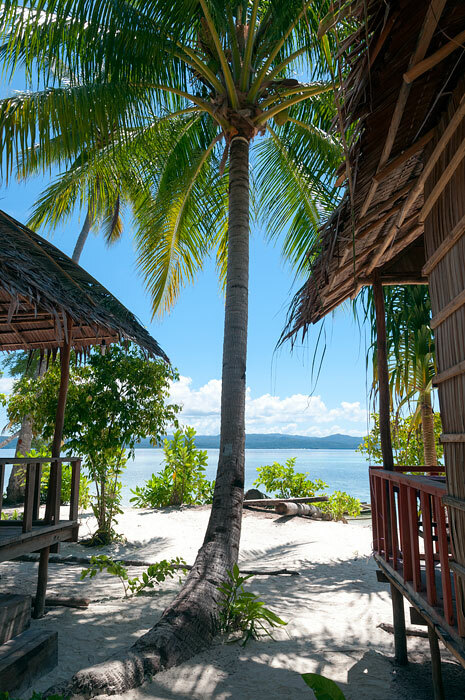 Intum Homestay occupies a beautiful little stretch of beach at the eastern end of the north shore of Kri Island. 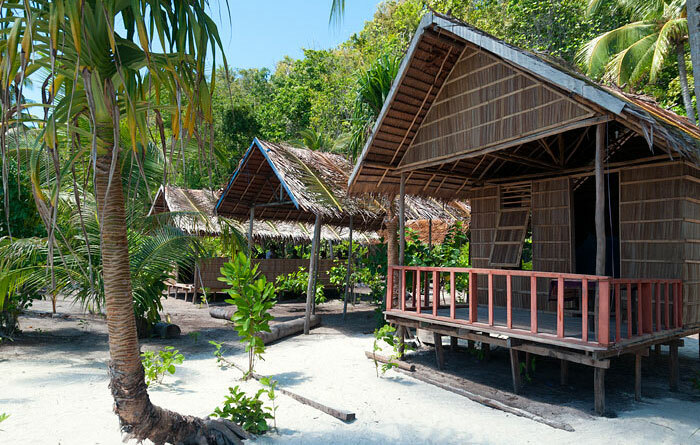 One over-water and three single room private bungalows on land are available. 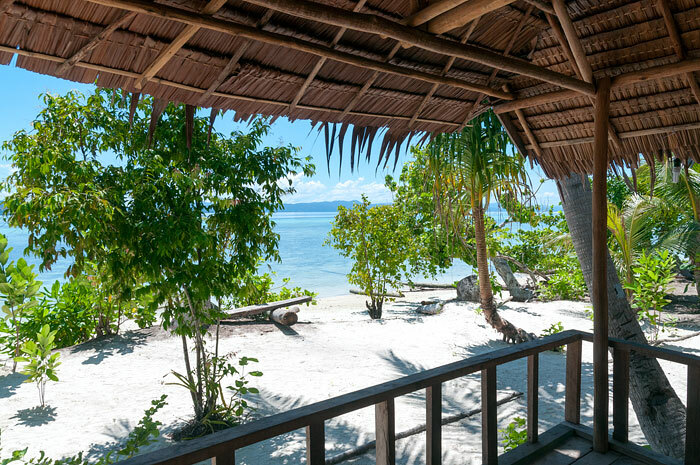 Each bungalow has a verandah with a table and sea views and sleeps two in a bedroom equipped with a mattress on the floor, with pillows, bolsters, sheets and a mosquito net. 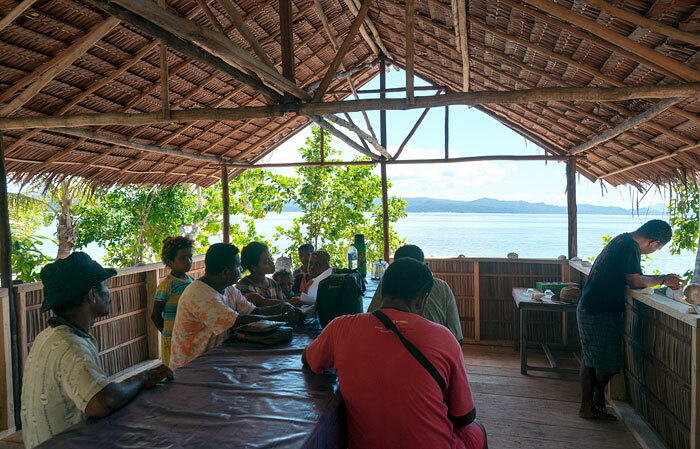 Meals at Intum Homestay are served in the homestay dining room which also has an ocean view, a large table and bench seating. Free drinking water, tea and coffee are provided there for guests. 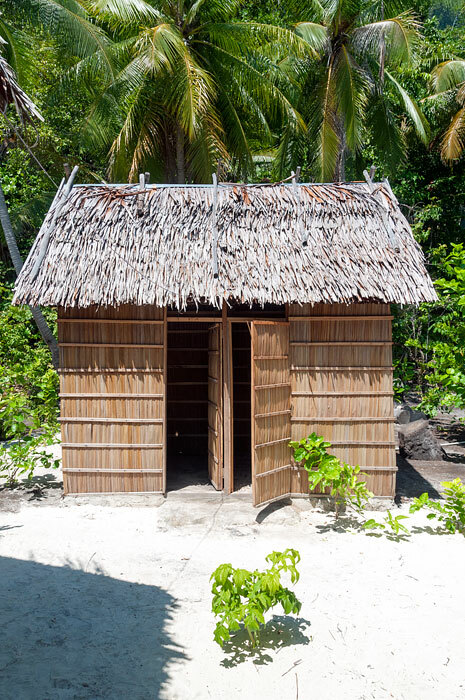 Guests share Intum’s bathroom building which has two rooms. A western style toilet on a concrete floor occupies one and the other is the usual pebble floored dip mandi style bathroom. Electricity is supplied by generator between sunset and midnight, but only a weak phone signal was available when we visited in June 2016. A data connection wasn’t possible, but one could be had by walking a few hundred metres up the beach to the Yenkoranu Homestay jetty. 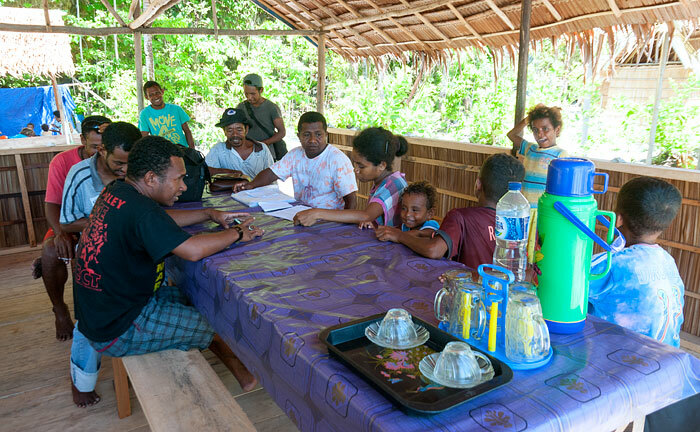 The nearest village for supplies is Yenbuba on Mansuar, which is about a 20 minute boat ride away. It would be best to bring any supplies you consider essential with you, as only basics are available in Yenbuba. Please be sure to take all inorganic rubbish like plastics and dead batteries away with you when you leave so you don’t contribute to the trashing of paradise. Only a little English is spoken at Intum Homestay, so a phrasebook will help ease any communications issues if you don’t speak Bahasa Indonesia. 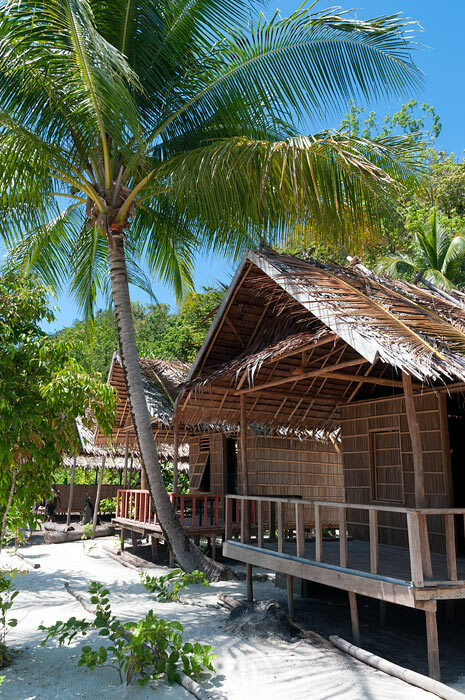 Intum Homestay has fabulous snorkelling at the door and diving can be easily arranged at nearby Kri dive centres. Kri also provides the opportunity for long hikes along its beaches at low tide. It’s even possible to cross the sandbanks to Yenbuba village on Mansuar and continue on from there. (You’d need a morning low tide and a pickup from your endpoint on Mansuar though.) There are also jungle paths that provide access to Kri’s heights where panoramic views of the Dampier Strait islands are available. 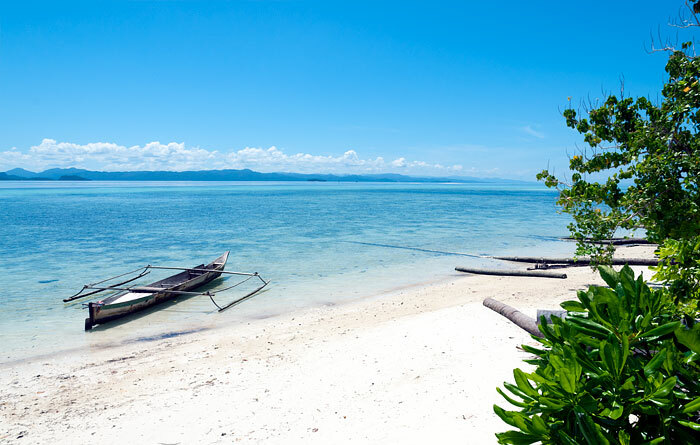 Intum offers free trips to the nearby Pasir Timbul sandbank which emerges from the ocean at every low tide, and can arrange sightseeing and snorkelling trips as required. Some of the possibilities are listed in the table below. Prices are Indonesian Rupiah and trip cost is shared by longboat passengers (maximum of 4). I stay in Intum for 2 nights same reason as Lumba Lumba is full. Pick up by Dedy’s boat, but super late as me and another Germany couple are the first one to ask but last ones to leave, aorund 90mins wait or something, that’s quite depressing as every time, there is people like to share a boat with us but we are not allowed and asked to wait. 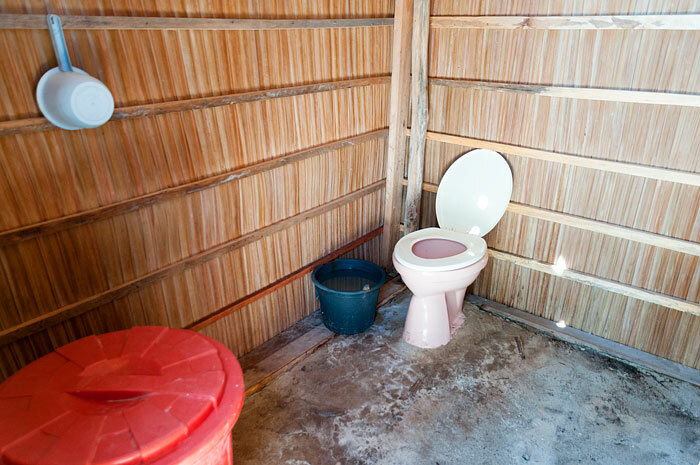 Only the 2 over water baglows are good condition for guests, the on 3 land ones, 2 of them for guests are too closed to toilet if you don’t want your head are 3-5 meters away from a smelly toilet . 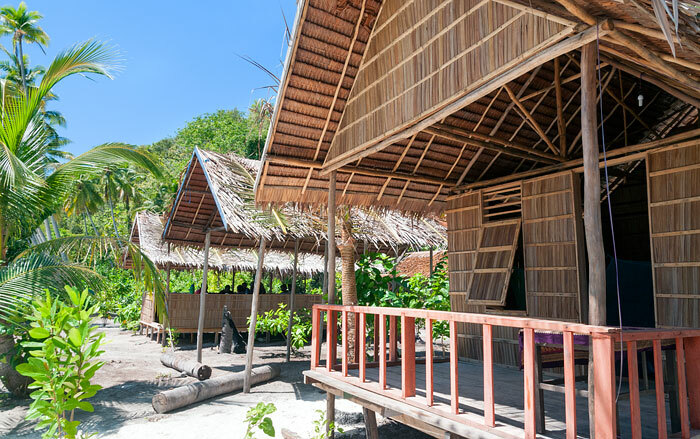 When I find the homestay next door is much clean and better condition, I asked Mayryana could I stay one night there and move back after the Germany couple move to Lumba Lumba.The answer is of corse no. Instead they move their own bagalow and ask me to move in. 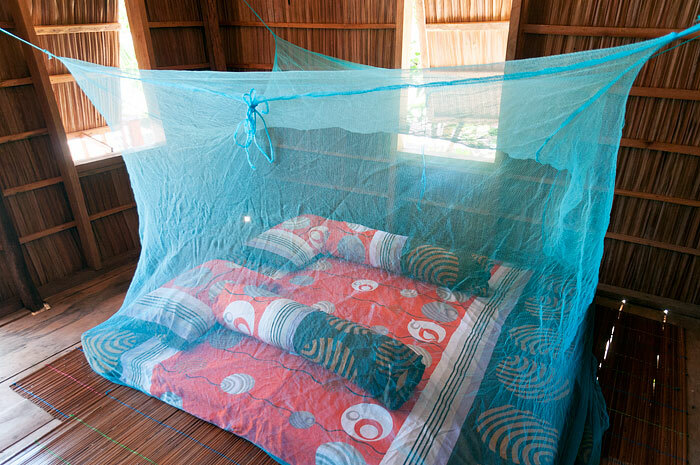 I give the overwater bagalow to the couple only because they have a overnight flight and they dersve a good sleep. But I did not realized how bad my bagalow is until the next day The couple move to Lumba Lumba, and I move in the left over water one. The 1st on land bagalow I stay is very dark, oilly, smell, dry red saliva of betel next to the bed… very dirty and oilly mattress…At the benging, I think maybe it’s normal in Kri island as the page said don’t expect too much… So I put all my long Jacket on, put my towel but could not sleep all night and keep thinking why I am here and get my stomach pain… I am not a neat freak, but if you happen to book their on land boagarlow…Pls do double check about it..things may change, maybe 2 or 3 month later, they get their new toilet build, it may be get better. But I don’t think it maintained as good as other homestay. I hate to write comments. Writing down this does not mean anything bad to Maryana, she tried her best…But if you are a solo female traveller, I would strongly suggest you book the west end of home stay. Better views, good signal, transport and information sharing.. Some more world about Lumba Lumba. I did not stay there so I have no rights to comment. 1. Most people are attracted by the promotion of meeting with dolphines, but as far as you stay in Kri island, you say them quite often. LL is not the only place. 2. They are not the best place for singal, so reservision and reply one day or middle night. 3. Time is not valve here as they promised a time and double checked, it could be 2 or 3 hrs late. Not only the first day pick up from Waisai, same happens the 3rd day they pick me up today. Promise early morning, ends up 2:00 pm. Thank you for your comments. Maryana and Manuel is one of the young couple of the Island who are brave enough to run this tourism bussiness. Your feedback is really worth in helping this family continue to build the quality of the service. Thank you very much. I apologize for late pick up in Waisai due to Sunday and church time. On the day when you supposed to move to Lumba lumba, my driver was late 19 minutes. You went for snorkeling on that morning. Our boat was waiting until the driver decided to go back to Lumba lumba since we need to take our guests to Waisai to catch the 2 om ferry. I have replied all your message via whatsapp. Thank you Jean for your good feedback. We stayed at Intum over the xmas period for 4 days and we loved it. We sent the request about 3 weeks in advance and the homestay accepted almost next day. I had sent a request 6 months earlier w no response, but I realize that’s a stupidly long amount of time lag so my advice to you guys is to book within 1-2 months and you will have a faster respond. Homestay: we were the only guests there so we had all the privacy to ourselves. The overwater bungalow was so nice, and at high tide, boat can even come pick you up direct from the place. The room is on the smaller side and fits comfortably 2 people but not more. It’s also a bit stuffy in the room because of no air flow. Amenities & food: nice dining room, clean bathroom. 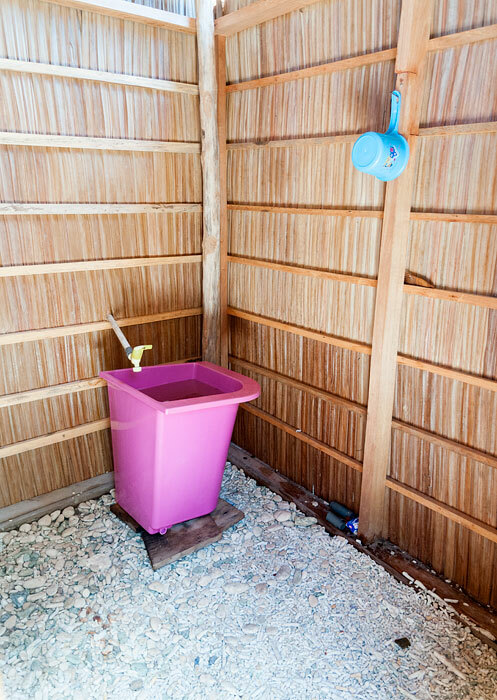 Kri does not have fresh water for bathing so can’t fault the homestay for that. Really nice food provided for 3 meals/day. If you snack in between, I recommend to bring your own snack because no food outside of meal time besides from fruit. The key is to not leave food in the room but to tie it up on the string. Diving: if you are a diver, and going during high season like us, here’s some info we wished we knew. The homestay is located at the end of the island (look at map) and you need to walk to other dive centers to make reservation. we passed: Kri eco resort, Yenkoranu, Wobbegong, Soul Scuba. Kri eco resort do not take outside guests. And the rest of the dive centers minus soul scuba prioritize guests staying with them (shocking….). So what that translates is we almost could not dive during our time at Kri because the earliest availability was 1 day before our departure. These centers also do not take reservation online. Yenkoranu ignored my messages. We were lucky to find Soul Scuba, and they also take reservation online (N/a for us cuz we walked there but FYI). Their price is not the cheapest but we didn’t have options. Also, since Intum is located at the end of the island, to walk to Soul Scuba took us like 45 mins. It’s not a bad walk to trade for privacy but I don’t know if we would do it again. The dive centers picked us up on the later days as well. Payment: unless you like to carry a stack of cash, here’s what we found. We paid cash to family for house & boat but I’m sure you can do bank transfer. Soul Scuba accepts Paypal friend & family, or bank transfer as well. The raja park entrance can be paid w credit card (+2.5% card fee). Family: they speak very little English but we could communicate time of breakfast and drop off in Waisai. The parents of Maryanna are very nice and took care of our last lunch & boat transfer. Overall really nice people who took good care of you during the stay. Phone servie & internet: works relatively well at Intum in Dec 18. I have Tmobile international plan and my 2G internet works well enough to send whatsapp and post on IG. Overall we enjoy the privacy, food and Kri but we’d move somewhere closer to dive center next time. Here are some photos and video of Intum taken by drone. We stayed with Emanuel and Maryanne’s family for four nights in the very last bungalow on Kri. A wonderful experience – especially watching their very active and adventurous children. 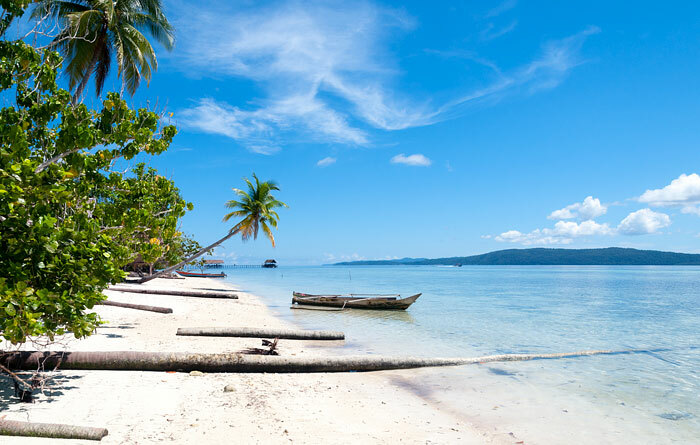 It is a long swim out to the coral from the shore and care needs to be taken to time when you go out as it is hard to get back over the coral when the tide goes out. 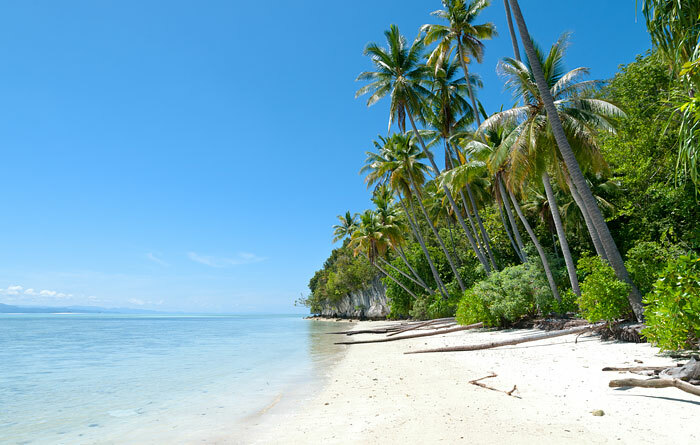 Also, as with all of Raja Ampat, the tides are strong and changeable. Emanuel was very willing to organise boat trips and his rates were fair. 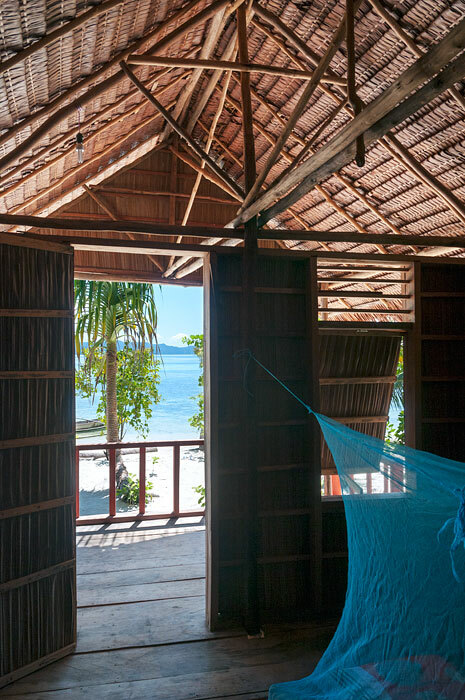 We stayed 5 nights early November at Intum in one of the two Overwater bungalows and were very happy about this choice. 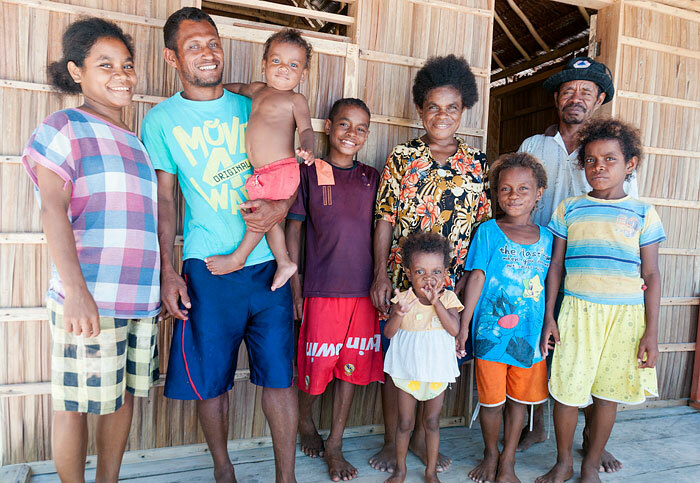 Immanuel, Maryana and their kids are a lovely family, we got plenty of good food and the hut over the water gives a fantastic view on the ocean, on sunsets and on the fish swimming below. At high tide one can jump into the water right out of bed. Facilities are clean and standard, a new larger facility hut is just being built and looks as if it would be ready soon. Nobody approached us about trips or any extra spendings, but when we asked Imanuel was always ready to help. Highly recommended! I’ve stayed here for 4 days and I felt like a wallet… I was the only guest in the homestay and now I know why… I’ve payed everything at the beginning because they didn’t stop asking me money, and it’s okay!!!! (I couldn’t running away anyway but doesn’t matter). The first day Every meal was really poor (boiled rice, 1 plate of vegetables) not tofu, not Tempe, not fish, not meat… so the second day I’ve asked them if I could please have some protein doesn’t matter which kind of…. they told me that I had to pay extra for that…😱😱 okay so I said no!!! 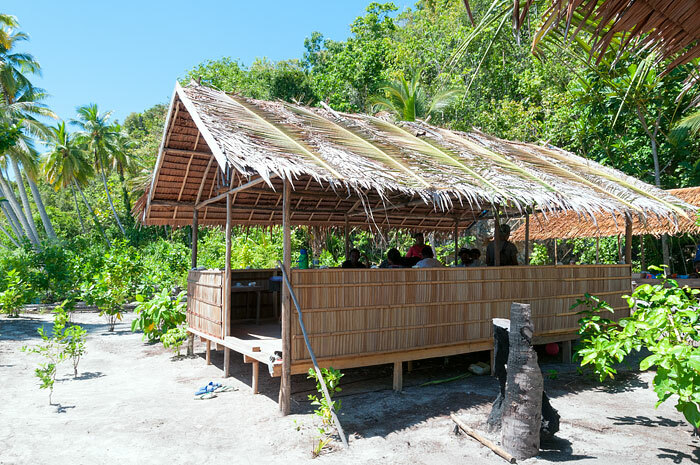 And I’ve stayed there for other 2 days and then I had to leave…and I went to ask to the others homestay how much was the price to move to others islands and I founded a really cheap share boat!!! So I went back to Intum homestay and I told them that I definitely move to another island with some ppl met in another homestay… and they started to attack me and told me that I couldn’t leave the island with a lift from other homestay…🤔🤔 what a hell??? Are you joking??? I could share the cost of the boat with other ppl so I’m going…👋🏻👋🏻anyway they followed me until the boat and they start to have an argument with the owner of the other homestay… and on the way to leave they start to fight with him…!!!! !😱😱 I was really scared about that!!!! Fortunately I left the homestay on time!!! If want to spend money in homestay don’t go to this one!!!! Same happens to me today. I tell Maryana Lumba Lumba would pick me up 9-10am, and she get a cold face. When LL send a boat pick me up, she did not told me and told Dedy I want to stay in Intum. Even at last, I did not move to LL as they are too late to pick me up, I met one local tourist here and ask could he help me to check where he stay has a room available. At last, I paid 150,000 for the transport from east Intum to not far West. Hi kiky ..you are a person who doesn’t know thakn you. You come and don’t pay well so how can buy food.you understand with the person you are participating in.you understand.I am not a person who does not know the bussines. But if i take care of you .you don’t like it and all you have to know is that people who speak good english are cunning people ,they can cheat you want him to understand .and understand.so if you come , you can’t be LUKY with cunning people.MARYANA TO KIKY . This family is so nice! I was the only guest and was fed very, very well! I didn’t reserve ahead of time so the first night not much food but then the next two days there was tons and it was very good. I stayed in the one overwater bungalow. 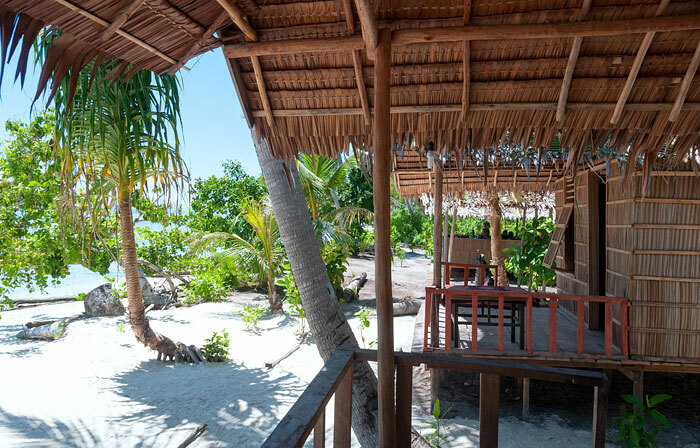 I stayed in RA a month on 4 islands at 6 homestays, this was my absolute favorite bungalow it was stunning. Perfect position where you can lay in the hammock to view the sunrise and sunset. At high tide you can jump off the deck come up the steps. There are fish underneath and birds perched on the wooden poles sticking out of the water. It’s such a beautiful place. But the snorkeling is not really any good. Far off there is a drop off with a little bit of coral and fish but it’s quite dangerous with a serious current. One day I walked out on the reef (on the sand of course) and explored, that was cool. Another day I had the owner drop me off at the trail head on the southwest of the island and hiked up to the viewpoint and timed my return with the low tide so I could walk back. Only problem is there is a resort that doesn’t want anyone on “their property “ but I just walked quickly though as that is the only way to get to Intum. Of course their guests are walking through other homestay properties without a problem. Lovely hosts and food, but there are rats getting in the bungalows at night and the kitchen area didn’t feel very clean and organised, compared to other homestays. I stayed at Intum Homestay at the beginning of march 2018. Intum Homestay luckily turned out to be one of the most secluded. 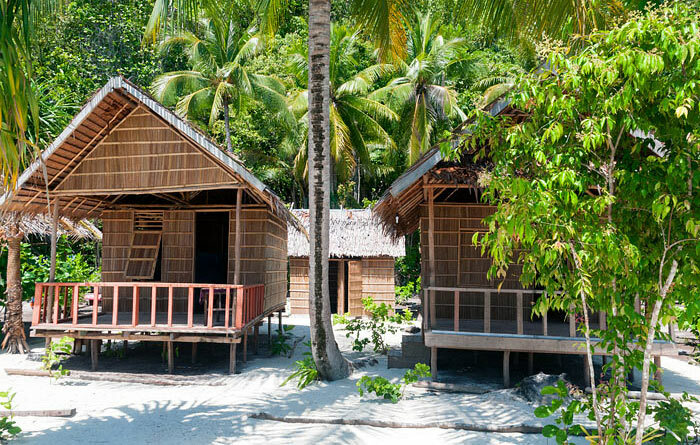 With their own little sandy beach, the ones you see in stock photography, and a beautiful secluded watervilla. Plans are made to build more of these in front of the homestay. Maryanna is a wonderful mother and cook, and the family makes you feel really welcome. Did a wonderful snorkelling trip with Joshua. He knows the spots, and led me to the sharks! The video is SO helpful since I’m looking to book Raja! I always wonder if real life is as good as photo. You did such a great job with filming and editing. Thank you so much! I have stayed over the years in many homestays in RajAmpat. Last November I spent a few days at Intum. I think I had the best meals in RajAmpat. It’s a small place and they really make an effort to provide excellent meals, mostly fish. As for the rest, it’s Kri north coast, underwater can’t get any better. Thank you Maryana and family. Terima kasih, sampai jumpa lagi tahun depan. Kami di layani dengan baik..kami juga kagum dengan makan di intum home stay sangat enak..membuat saya terharu..hotel nya juga nyaman..dan sejuk..pemandangan yang mengagum kan..membuat saya terharu …a’m like IINTUM HOME STAY …. semuanya sudah sangat baik, hanya tempat tidur yang dibuat lebih nyaman lagi. We stay at Intum’s for 2 nights because Lumba Lumba was full and they found a bungalow here. It’s a small guesthouse which shares the kitchen and living area with the neighborhood guesthouse. The bungalow are new and the owner are very nice and kind. They don’t speak English, except a few words, but we found a way to comunicate and everything was great here. We really suggest this homestay!